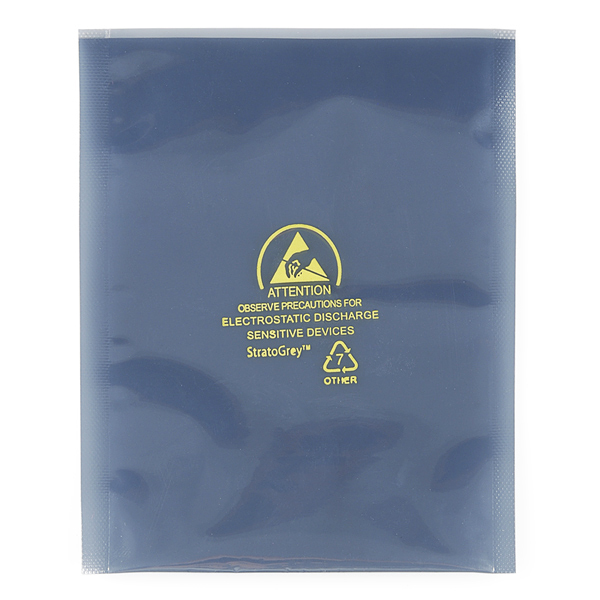 Static Shielding Bag - 4" x 6"
You probably recognize these StratoGrey static shielding bags. Not only do we use them to protect our more sensitive components during shipping, but they're fairly ubiquitous in the electronics world. Their buried metal construction provides Faraday Cage protection meeting electrostatic requirements of MIL B-81705 Type 3 (One of you probably knows what that means). Also, they're heat-sealable for dust and moisture resistance! These are great for shipping sensitive devices or just storing them in your shop. Nice - not a bad price either. Now get some anti-static foam (the good stuff, not the soft pink kind, or the flimsy (low density) black kind) and we're in business! Foam is nice and all but, Have you considered IC Storage Tubes? Better protection against mechanical damage and cheap. Those are nice, but I already keep my IC + foam in configurable storage containers. I also have way more non-IC parts (that need foam) than ICs, so I can warrant buying just a large sheet of foam. That black foam stuff, that would be perfect. I vote for that too. These are definitely handy to keep around in bulk. However, these are just the bags, and don't have the zip-lock style fasteners on the ends, which would really be handy. 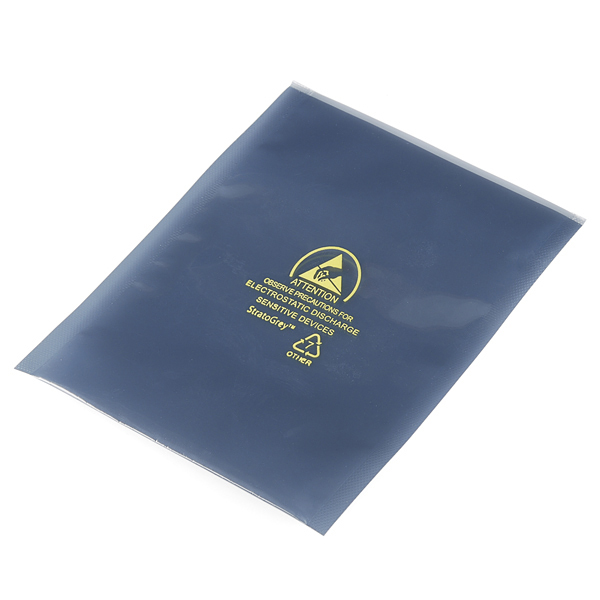 SF uses at least a couple of different sizes of reclosable anti-static bags to ship parts to us, so I'm not sure why they don't sell all those different styles to us. Having a reclosable bag is really handy for small parts. But for Arduinos and larger parts, these are fine. For some reason, this item would sound more epic if it were called a Bag of Static Shielding. Sadly, these are not zip-top style resealable (and I suspect most people do not want to heat-seal their bags). Look for item "116 0225" on Amazon and you'll see what I mean. It would be great if SFE carried these too. But I'm worried about static shielding... will it come in a Static Shielding Bag? They could but then that bag has to be put in a bag and then another bag. Well you can see where this could go. So I'm assuming they just super saturate the bag with anti-static juice figuring some will be lost during shipping.